Follow the adventures of spirited reader, Anne Shirley as she settles into her new home, makes friends, and stirs up trouble. Farm-owning siblings Marilla and Matthew Cuthbert want to adopt a boy to help them around the farm. In a mix-up, the orphanage sends them the active and imaginative Anne Shirley instead. They make the most of the mistake as Anne becomes the beloved heart of the family and community, as well as of generations of readers. With illustrations by M.A. and W.J.A. Claus, this beautiful, vibrant clothbound hardcover is unabridged and makes a great addition to every home library. The Knickerbocker Classics bring together the essential works of classic authors from around the world in stunning editions to be collected and enjoyed. L.M. Montgomery (1874-1942) was a Canadian writer, born on Prince Edward Island. 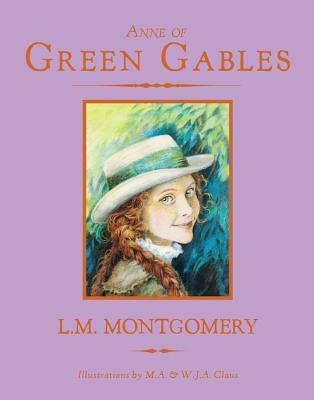 In 1908, she published Anne of Green Gables, her most successful work and the start of a series of novels. Montgomery went on to publish 20 novels, 530 short stories, 500 poems, and 30 essays. Many of her stories are set on Prince Edward Island. In 1935, Montgomery was made an Officer of the Order of the British Empire for her contributions to literature.